Transformed through the years into a modern 4 bedroom family entertainer, this home offers quality upgrades and lifestyle options. The outstanding features begin with the polished Rose Gum timber floors, high ceilings, double brick walls and entertainer's kitchen overlooking living areas and outdoor level yard. An extra wide entry hall opens up to the double height gallery with east facing window. The designer kitchen features new oven and 4 burner gas stove, Caesarstone benchtops, cabinetry with soft close drawers, dishwasher, island bench with loads of storage & office nook. High ceilings give a sense of space and glass brick feature windows fill the open plan kitchen & living room with light while simultaneously offering privacy. A gas bayonet is located in the living area. The kitchen also overlooks the formal dining room which opens onto the outdoor covered entertaining deck. The upper floor has two bedrooms, the main bedroom with reverse cycle air conditioner, new ensuite with large shower plus a clever walk in robe with feature window. The second bedroom is large, light filled and can be used as a second living/office space. This level also features a covered balcony to enjoy your morning coffee together. 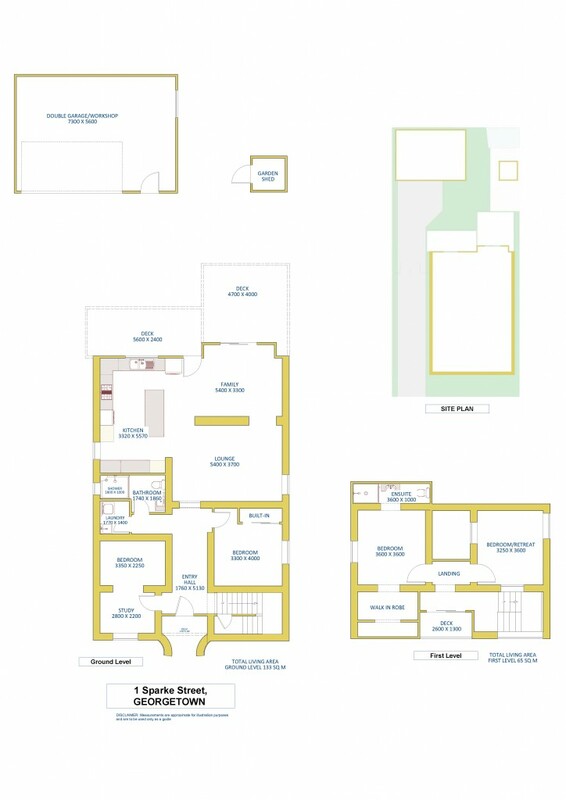 The 2 additional bedrooms are on the ground level, one is a large queen sized with wardrobes, ceiling fan, new carpet and the second has air conditioner & two sections to suit teen study space or children's toy room. The fully fenced, level yard includes extended concrete drive and new 2 car garage with workshop space and separate door. Designed for family living & privacy it features easy care grassed play area, huge entertaining deck, large garden shed, raised vegetable garden and a 3000L water tank with pump for easy watering. The double brick property originates from 1890 on approximately 520m2 block and is located an easy walk to Waratah Village Shopping Centre, Georgetown cafes and local shops and within minutes to McDonald Jones Stadium, University of Newcastle and direct driving routes to CBD. View video for the experience of this true gem in Georgetown.